We will treat the advection inversion in which warm air flows over colder air first. This case merits first position not because it is important in light behavior on the Marfa plain, but because it has been proposed by people trying to forge an explanation for the mysterious Marfa lights. In turn, the model has been commonly cited by others. In the discussion below, we use an example with winds coming from the south. We did this even though winds blow from every direction in Marfa. They are different on a month-to-month basis; they vary with the time of day and night; and their probabilities of occurrence and direction are dependent on the wind speeds. But if you stand on the observation platform at the Marfa Lights Viewing Center in mid afternoon, on a fair-weather day with winds of 10 mph or less, you’ll probably feel them blowing from a southerly direction. That’s why we used a southerly wind. Fortunately, the conclusion reached below is not dependent of the wind direction. Figure 1 is an illustration of the Marfa plain and adjacent hills in an arrangement that suggests that the plain is in a basin. This arrangement is what we’ll call the tea-cup profile of the terrain. It has been asserted by others that there is cold air in the bottom of the cup, and hot air blows in from regions away from the tea cup, trapping the cold air below it. s two books. [1,2] He not only asserted that the foreign hot air trapped the cold air, but that the cold air also acted like a lens bending light rays and creating night-time mirage conditions. No further explanation was provided. But is the tea cup a valid model? Looking at the figure, it certainly appears to be plausible. There is a distinct pocket that seems like it would be protected from the warm wind. Let’s see if the model holds up to further examination. The first thing to consider is that the Marfa plain is really not “surrounded” by hills. The hills at the edges of the plain vary considerably in elevation. For example, if we consider the hills on the southern side of the Marfa plain and examine their heights going from east to west, we find that they trend downward from more than 700 feet above the plain on the east down to essentially level with the plain on the western edge. An even greater absence of hills exists along the path of Alamito Creek on the western side of the plain. From the city of Marfa all the way down to the Rio Grande, the terrain adjacent to Alamito Creek falls at a steady rate without any hills to impede the flow of southern winds. See the MAP on this website and Figure 2.1 in our book, Mysteries of the Marfa Lights Revealed, to gain some appreciation of the Marfa plain and its adjacent hills. To examine the elevation of the hills in some detail, let’s take an intermediate east/west location and determine the real elevation profile of the hills and the Marfa plain. Consider a north-south line that passes through both, Crenshaw Mountain (elevation 5869 feet asl) on the north side of the plain and the mesa just west of Whirlwind Mesa on the south side of the plain. Crenshaw Mountain was chosen for this examination because its one of the highest prominences adjacent to the north side of the Marfa plain, so it will show the tea-cup appearance better than other nearby hills. A good approximation to the true shape of the elevation along this line is shown in Figure 2. This shape can be confirmed by anyone who wants to invest the effort. To start, just go to the United States Geological Survey website  and get a copy of the topographical maps covering the region shown in Figure 2. Draw a north-south line through Crenshaw peak, and read off the elevation contours of the map as a function of distance along the north-south line. You’ll find good agreement with Figure 2. The north direction is on the left side of Figure 2; south is on the right side. 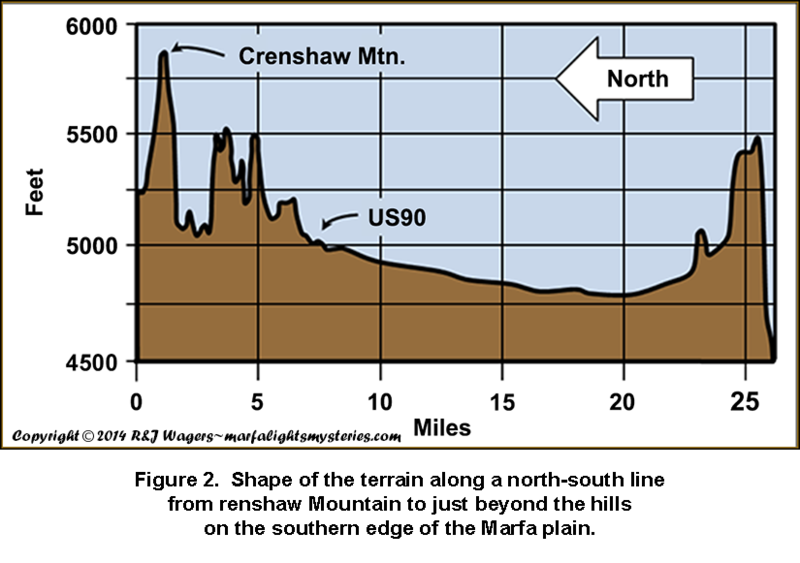 While Crenshaw Mountain (@ 30.36°N, 103.82°W) tops out at 5869 feet asl, the mesa on the right side of the figure reaches 5500 feet asl. For orientation, we’ve shown where highway US90 is located on the north side of the Marfa plain. Since US90 travels approximately east-west at the cross section in Figure 2, it would extend out of the page toward the reader. The Marfa Lights Viewing Center is just 3.5 miles west on US90 from the elevation profile shown. Another reference point is Paisano Peak. (See the MAP.) This extinct volcano is 2.9 miles east of the cross section in Figure 2. Figure 2 seems to confirm the tea-cup model shown in Figure 1. There are tall mountains/hills left and right of the Marfa plain. But Figure 2 also shows something that Figure 1 doesn’t – numerical values on the axes. Without numerical values on the horizontal and vertical axes, Figure 1 is just a cartoon. The height and width of the cartoon were selected by previous authors to give the impression of a tea cup. But, you could be misled by the apparent relation of the height to the width in the cartoon because there are no spatial dimensions provided. Figure 2 uses two different scales on the two axes – one in feet and one in miles. So although you can’t get an intuitive feel for the relative heights just by looking at the figure, you’re less likely to be misled because all the relevant dimensions are on the axes. Using this graph, we find that the minimum elevation of the plain is about 4800 feet asl on this cross section of the plain. Thus, Crenshaw Mountain is about 1100 feet above the low spot, and the mesa on the right of the figure is about 700 feet above the low spot. But are these impressive barriers sufficient to enable an overlying hot air layer to trap cold air below it in a “basin”? To know how much of a barrier the hills present, you need to put the elevations in context. For example, consider a barn on the Marfa plain. The barn will block wind from you if you stand on its lee side. But what protection does it afford you if you’re standing 1000 feet downwind? The answer is obviously none. You know this intuitively, because you know the relative sizes of a person, a barn, and 1000 feet of separation. Figure 3 puts the mountains of Figure 2 in context with the 18-mile expansive plain. Figure 3 is a plot of the same data that appeared in Figure 2. But, in this case, the scales of the vertical and horizontal axes are the same. A centimeter of length along the horizontal axis is the same number of miles as a centimeter of length along the vertical axis. The horizontal axes are the same in Figures 2 and 3. And the lowest point on the vertical axes is the same, 4500 feet asl. But in Figure 3, the 30900 feet asl elevation at the top of the plot is five miles higher than the low point. (4500 + (5 x 5280)). When the elevation profile is plotted with equal scales vertically and horizontally, it is clear that the winds would blow right past the adjacent hills and travel unimpeded across the Marfa plain – just as they passed the barn. In spite of what the literature would have you believe, the Marfa plain does not have a tea-cup basin to hold a pool of cold air while warm air blows over the top. We have gone to some length here to explain the tea-cup model and why it is incorrect because it appears commonly in the literature. In fact, it was recently shown again. This time it was on the TV program, Monumental Mysteries, in 2013. Interestingly, the figure they showed bore a remarkable resemblance to the one Bunnell published. But while Bunnell suggested that mysterious lights were caused by a “bubble” of trapped cold air that acted as a lens, the Monumental Mysteries narrator referred to the light as being bent at the interface between the hot-air stream aloft and the cold air trapped below. Her hand gestures indicated that the light was reflected at the interface between the air masses. In fact, both explanations are wrong on multiple points. But we only need the absence of a tea cup on the Marfa plain to dismiss both explanations.